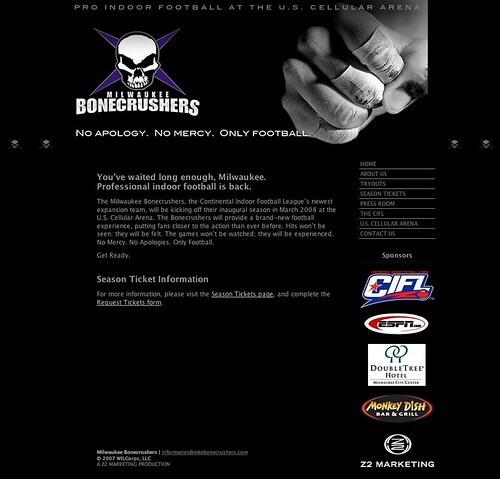 Starting in March of 2008, Indoor Football will be back in Milwaukee… The new team is the Milwaukee Bonecrushers. Oh yeah, back to the football. Honestly, I am not much of a football fan (saying this in Wisconsin could get me strung up, but it’s true) but I’ve got to know some of the Bonecrushers, and these guys are passionate about what they are doing: having their own team, and having it in Milwaukee, has been a dream of theirs, and it’s exciting to see it come true. Posted on Sunday, July 22nd, 2007 at 7:00 am. Subscribe to the comments feed. Both comments and pings are currently closed. Post on your own blog. Was this purely your baby or did you work with a team on this site? Either way, it looks great. Nicely done. I’ve been salivating over getting season tickets ever since rumors of the team started circulating a couple months ago. And well and behold I just got an email from you about my ticket request. I’ll see what I can do to get you the inside track.